Kalaigandhi. V. and S. Kiruthika, 2011. Screening of free living nitrogen fixing Bacteria Azotobacter and associative organisms by molecular techniques. J. Biotechnol., 1: 36-49. Kalaigandhi, V., E. Kannapiran, H. Muraleedharan and A. Micheal, 2011. nifH gene of reference being the source to study the marine Azotobacter sp. J. Sci. Trans. Environ. Technol., 5: 37-42. Kalaigandhi, V. and E. Kannapiran, 2011. Qualitative and quantitative examination of plant growth hormone production using Azotobacter isolated from seagrass ecosystem of Tondi. Asian J. Microbiol. Biotech. Env. Sci., 13: 619-624. Arulselvi, S. and V. Kalaigandhi, 2011. Antimicrobial activity and MIC effects of Acalypha indiaca against corneal ulcer. Proceedings of the National Symposium on Biopharmaceuticals their Application in Disease Prevention and Health Promotion Organized by Dept. 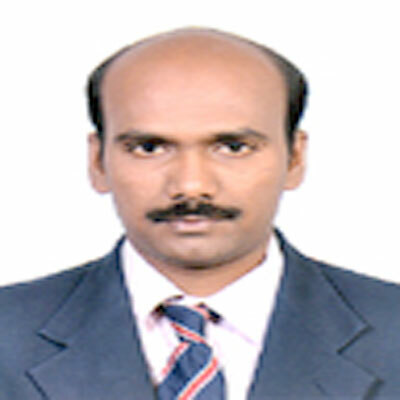 of Microbiology, August 4-5, 2011, Coimbatore, -. Muraleedharan, H., V. Kalaigandhi and E. Kannapiran, 2010. Screening of Vibrio sp. from Rameswaram island South east coast of India. Proceedings of the National Seminar on "Human Pathogens" NSHP organized by School of Biosciences, March 31, 2010, Coimbatore, -. Krishnan, S., R. Subashkumar, G. Vivekanandhan, V. Kalaigandhi and T. Thayumanavan, 2010. Co-occurrence of Aeromonas hydrophila, Vibrio parahaemolyticus and Salmonella enteritidis in marine marketed fish, Coimbatore city. Proceedings of the National Seminar on "Human Pathogens" NSHP organized by School of Biosciences, March 31, 2010, Dr.G.R. Damodaran College of Science -. Kalaigandhi, V., E. Kannapiran, Harimuraleedharan, A. Michael, T. Sivakumar and V.T. Arasu, 2010. Azotobacter population in rhizosphere and non-rhizosphere sediments of tondi coast. Int. J. Biol. Technol., 1: 63-65. Kalaigandhi, V., E. Kannapiran, H. Muraleedharan and T.V. Arasu, 2010. Screening of marine Azotobacter sp using nifH gene by PCR technique. J. Adv. Biotechnol., 10: 33-35. Kalaigandhi, V., 2010. Molecular screening methods for nitrogen fixers. Proceedings of the National Seminar on "MICROBIAL DIAGNOSTICS" Microbial Technology-(mt-'10), March 18, 2010, Deprtment of Microbiology, Dr.G.R. Damodaran College of Science, -. James, A. and V. Kalaigandhi, 2010. Metagenomical analysis of the genus Azotobacter distributed in different environmental microbiomes. Proceedings of the National Seminar on "MICROBIAL DIAGNOSTICS" Microbial Technology- (mt-'10), March 18, 2010, Deprtment of Microbiology, Dr.G.R. Damodaran College of Science, -. Harimuraleedharan, E. Kannapiran, V. Kalaigandhi and E. Michael, 2010. Ecology of total heterotrophic bacterial population from rameshwaram island (Palk Bay) Southeast coast of India. Int. J. Appl. Bioengineering, 4: 7-13. Muraleedharan, H., E. Kannapiran, V. Kalaigandhi and A. Michael, 2009. Antibiotic sensitivity test against the vibrio sp. isolated from Rameswaram Island. J. Scientific Transact. Envir. Technovation, 3: 64-68.